If you are not from Dublin you may not know The Wollen Mills has been the place for trimmings, needle craft supplies and good old wool sweater for decades. And now it is closing down for good. What are we going to do? Probably wander in the house with a blank face for a little while. 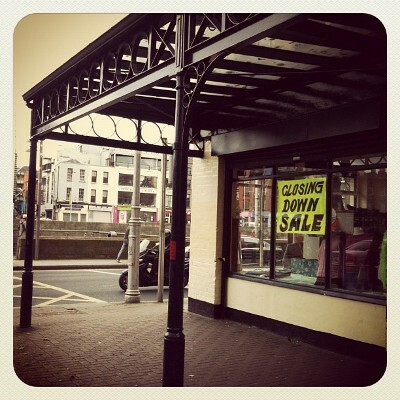 1 – The Wollen Mills are having a closing down sale. I was there on Saturday and secured some nice zippers and thread spools for a good price. They will probably add more bargains as time goes. 2 – We won’t be trimming shop orphans after all. It seems one member of the current staff is opening another shop on Capel Street. I am told it will be smaller than the current one but I don’t know when or where exactly. What about you? Do you know more about the mysterious Capel Street shop? Or do you want to share some good address for trimmings with us all?